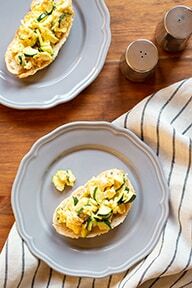 Zucchini and Eggs for an Anytime Meal | Good. Food. Stories. Growing up, I spent a lot of time in both the kitchen and garden with my grandparents. Nana and Papa grew piles of zucchini and used each and every one of them, along with the zucchini flowers. I’m told by family that as a baby, my favorite food was zucchini and eggs. 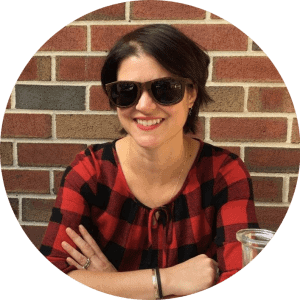 Mushy and nutritious—perfect baby food! And it’s a food that has grown up with me, from my first years through my earliest days at school. 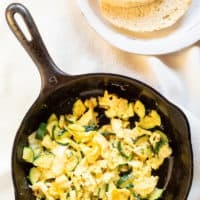 During a great rash of stolen lunches at Liberty Elementary, zucchini and eggs came to my rescue. I called home, delivered the news that I was lunch-less, and Nana whipped up a rush order, put it between two big pieces of crusty bread, and sent my Uncle Sonny tearing down the road to deliver it to me in a giant brown grocery bag. I sat down at a lunch table and happily unwrapped my sandwich while the other kids looked on at me like I was Andrew Zimmern. “EEEEW,” one of them screamed. It did not bother me in the least. In fact, I felt pity for her and her peanut butter and jelly on Wonder bread. Now, as an adult, I still haven’t grown out of zucchini and eggs. Today, my own fridge is brimming with zucchini from my CSA share and I’ve been having zucchini and eggs at least three times a week. You can eat it for breakfast, lunch, or dinner. You can eat it as a midday snack—or a midnight snack, for that matter. 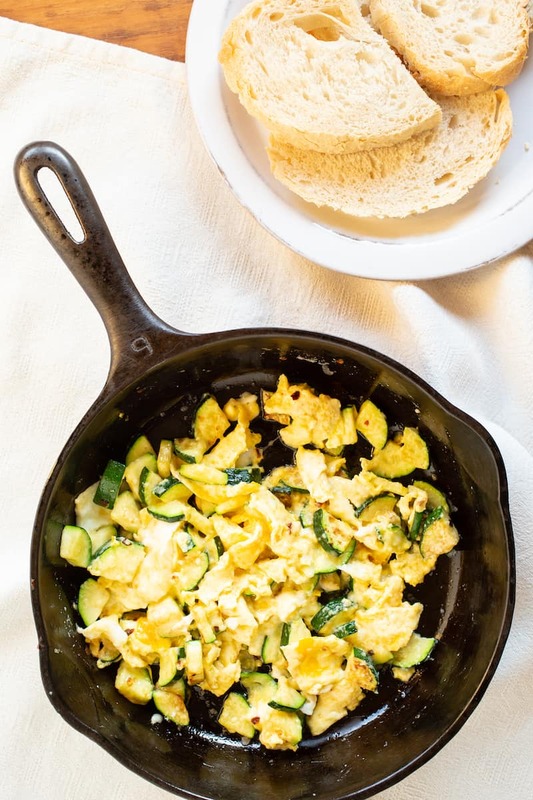 Zucchini and eggs will always be there to comfort you. I guess you could say that about peanut butter and jelly on Wonder bread, but I’d rather have this. When the farmers' markets are brimming with zucchini, it's time for a market-fresh meal. 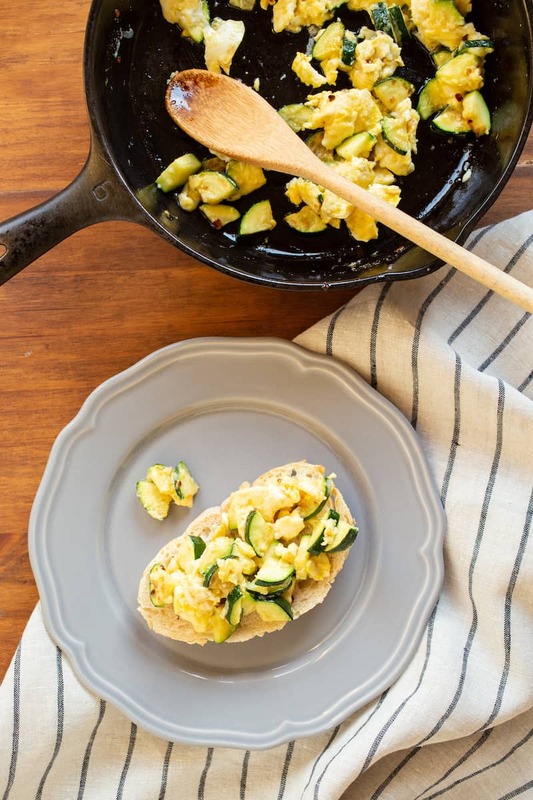 Try zucchini and eggs with butter and Parmesan. Slice the zucchini lengthwise into quarters, then slice crosswise into little triangles. If the center is too seedy, simply run your knife below the seedy part and remove it first. Add the zucchini and sprinkle with kosher salt, then stir gently and cook until they start to caramelize. Scrape the zucchini into a clean bowl and reduce the heat to low. Add the eggs and let them set for about 30 seconds. Return the zucchini to the pan and move them around with your spatula for another minute or so, just until the egg sets. Finally, add the grated cheese. Stir to combine, then taste and add more salt as needed. Serve on two slices of toasted French or Italian bread. (And don't be afraid to butter the bread first.) It's damn good on challah bread, too.